This book kind of took me off guard and affected me in a rather surprising way. Of course I was initially intrigued at the thought of reading it. Bill Watterson? Calvin and Hobbes? What could go wrong? 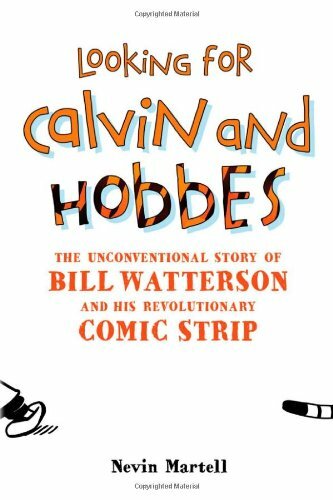 The full title of this book is Looking for Calvin and Hobbes: The Unconventional Story of Bill Watterson and his Revolutionary Comic Strip As many of you are likely aware, cartoonist Bill Watterson has opted to live an extremely private life and there is little to find out or know about the man behind Calvin and his best friend, Hobbes. A thirst for knowledge about Watterson drives Martell forward as he is writing this book. I kinda of thought it would be a curious and fun read but here's what happened instead . . .
Martell opened Looking for Calvin and Hobbes up by reminding his readers how intensely private Watterson is. He tells us that Watterson has refused all interviews and thinks people are making too big a deal out of the cartoonist. He wants to be left alone and he doesn't understand the hoopla. Watterson has never enjoyed giving interviews and keeps whatever public comments he does make focused on the comic strip and leaves out any personal details of his life. That's how he likes it. Martell then launches into an explanation of how he absolutely adored comics as he was growing up and how he fell in love with Calvin and Hobbes. Martell tells his readers that he enjoys writing but wanted to write a book about a.) something that he loved and b.) something that he didn't know very much about. After a little reflection he landed on the idea of writing about Watterson and he set out to discover as much as he could about the man. I promptly lost interest in most of the book. Watterson wants his private life left alone. He doesn't want us to know about him and he doesn't offer up information. Live and let live (but truly live!) seems to be the motto he goes by and the only information that is to be gotten must be coerced/requested out of friends and loved ones. I have to say, I have very little respect for someone who goes about asking for information from acquaintances and friends about a person you care to know something about. To me that kinda boils your conversations down to gossip. "Spill the beans! Tell me all you know!" If the direct source isn't interested in talking - don't push it. Let it be. Now, I did enjoy the little historical tidbits of information that Martell gave us about Calvin and Hobbes the comic strip. I found myself skimming the book, looking for that information. If he got too personal in his information about Watterson - I pretty much skipped and skimmed. What Watterson doesn't want me to know, I don't want to know about. I don't need to know about it. It's not my inherent right as a human being, an American, or a lover of Calvin and Hobbes. Watterson was born, he led a quiet life, he got married, and he's alive and enjoying life as best as he can. If I were him, I'd want to fade into the background as well. I understand his desire for privacy and I think that should be honored. We Americans tend to think we "need" to know everything there is to know about everyone and everything. We think we were born with rights to dissect and rule the lives of others but we simply are not in possession of that right. I found myself becoming more perturbed by the idea of this book and therefore was unable to sit back and just enjoy it for whatever it was that Martell wanted it to be. A work of devotion? A fan's journey trying to get as close to Watterson as possible? Now, like I said, I did enjoy learning a bit of the history behind the comic strip and how it came to be. I liked the interviews with original editors and Big Wigs who helped birth Calvin & Hobbes. It's fascinating to hear about how Watterson brought these characters to life and I would enjoy a more thorough work on that subject matter. But learning about Watterson just so that we can say we learned something he didn't want us to know about him? That's... not so very cool in my book. Looking for Calvin and Hobbes probably won't effect everyone the same way it did me. In fact, I've had to sit on this review for awhile and determine whether or not I really wanted to publish it! It will most likely come across as negative and I do have that intent in writing what I've written. I struggle against gossip and my feathers are ruffled when people hunt around for information after the direct source has declined to offer any. I feel like this book, although I know it is not the author's intention, shows a lack of respect for Watterson and his wishes. Because I knew Watterson wasn't the one giving out the information and refused involvement with the book, I couldn't read about anything personal. I wasn't invited to do so. I get rankled by Hollywood - wanting to dissect human beings before our very eyes so that we can feast on other people's lives. I get rankled by the public who demands to know specifics about our military operations when our military is trying to stealthily and swiftly win wars. I miss the respect people had during World War II and the good old slogan against gossip and rumors: "Loose Lips Sink Ships." I think that is very true. Our speech and what we choose to investigate and talk about should be edifying and uplifting and I don't think Martell manages to pull that off with this book. So I take issue with it, without knowing Watterson at all. If I were Watterson, I would be rolling my eyes at this book- at the very least! I'm happy knowing Calvin and Hobbes and that truly is enough for me. If you want to talk about the history of the strip - hey! I'm all ears! But about Watterson? Let's just enjoy the humor of the characters he created, what say? I would be remiss if I did not thank Continuum for sending me a copy of this book for review. Although it isn't typically my policy to publish a negative review of a book, I had such strong feelings about the means of creating this one that I felt I had to voice them. So I must send both my apologies and respects to Continuum and would want to quickly note that these opinions belong only to myself and I fully recognize that many other fans of Calvin & Hobbes are going to be interested and intrigued. Obviously - I was! I appreciate this, Carrie, and I agree. I don't know why people feel they have a "right" to know anything and everything about a person, and to continue to "dig" when that person has asked to be left alone is disrespectful. My oldest son has a lot of Calvin and Hobbes books with little tidbits here and there from Watterson about what was behind some of the strips, and I find that kind of thing fascinating. It's hard to know when to stop...when such information becomes gossip, but it's obvious that Watterson wasn't part of this book. I have thought about reading about Harper Lee...but feel that I wouldn't be reading her story bc she is also so private. I'd rather be respectful than informed of the gossip. LOVE Calvin and Hobbes, but totally get the author's privacy. Thanks, Carrie! Hello YES, all the way yes. At first I thought oohh what an interesting book! But after reading your review I completely agree. It is like unauthorized biographies. I often wonder... why? If the person doesn't vet this, how do you know it is correct? How do you know it isn't made up? Why do you need to know this if they didn't want to share it? And so on. I hate the whole celebrity obsession thing and how we feel we need to know every little detail of peoples lives. If someone wants to be private, I think they should have that right. I certainly won't be looking for this book. Very interesting! We've been reading some Calvin and Hobbes lately, so this is one I might have looked at. And I don't think it's really a negative review per se. You don't like it, you don't think the author should have written it based on his own introduction. You're just describing your reaction (which was negative, okay okay). I can see why you were interested in reading this book. 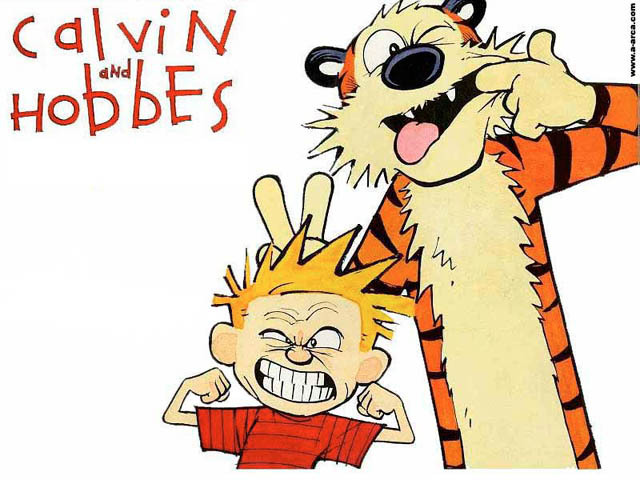 We also love Calvin and Hobbes and hearing about the creative mind behind them would be fun. Mainly I would want to know if he was writing from his own life experience as a boy or with boys. Because he is dead on with the imaginative boys in my life!!! I appreciate your thoughts on this, Carrie. Calvin & Hobbes is a HUGE phenomenon in our house right now, with all 3 of my guys involved. :) I probably would have been very curious about this book (and truth be told, I think I'm still a little curious). But I understand and agree with your feelings -- not wanting to dig where the subject wanted privacy. Hmmm. . . Yes, I agree. However, regarding the Harper Lee biography, Shields does use a lot of material (I.e. interviews, letters) that were written and/or published before Lee became as private as she is now. I guess it's sort of like the information in the book you skimmed for. I'm still not sure you'd like the Lee bio, but it doesnt seem terribly intrusive to me.